If you want a cigar that is not for just every smoker, but one that is cherished by aficionado, Rocky Patel Cigars is your brand. This premium quality cigar has its place at the top echelon of smoking lifestyle and only people bred in the art of smoking will value the intrinsic quality imbue in Rocky Patel. As you must have known, Windy City Cigars don’t just endorse a brand; we do so based on our unbiased research using our industry knowledge to weed out boys from men. This is a cigar with a distinction, and you will soon find out why we just cannot ignore this brand; we bring it for the love of smoking! This cigar is among the world’s favorites, and it offers a large variety of delectable smokes. 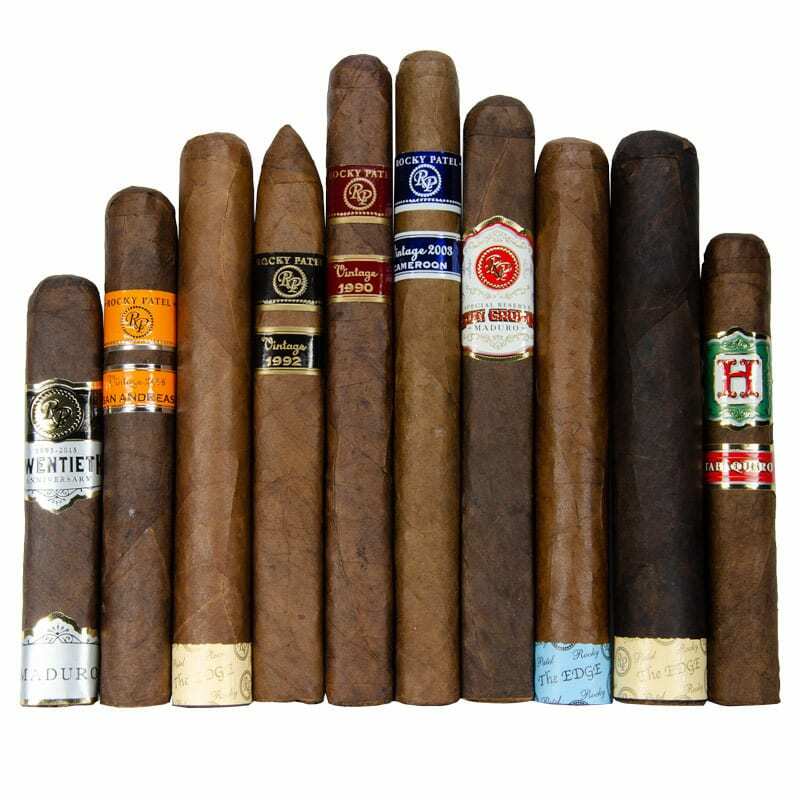 The brand has cigars that you will like, and everyone is a winner when it comes to pitching our tent with Rocky Patel brand of cigars. Historically, the cigar was introduced as a product of passion by the maker, an Indian, Florida-based cigars producer Rakesh “Rocky” Patel. He initiated the Indian Tabac blend in the middle of 1990s. The former Hollywood attorney had a healthy interaction with crème de la crème of cigar smokers including many actors and celebrities with whom he spent quality time admiring cigar smoking. His passion for cigars led him to create the beautiful cigar brand endorsed today by many connoisseurs. The legal practitioner turned cigar producer gave up his law job to become a full-time maker of the amazing cigar brand that is getting the attention of newbie and oldies in the world of cigar worldwide. Rakesh “Rocky” Patel is an India by birth born on 26 February 1961; He started the Indian Tabac brand in the mid-1990s. Rakesh was a Hollywood lawyer who worked with several actors, including Arnold Schwarzenegger and Gene Hackman. It was during his interactions with these Cigar enthusiasts that he was exposed to cigar smoking. Thus, he developed an interest in cigar business where he later gave up his legal practice to learn cigar art for five years in Honduras. The company changed from its old name ‘Indian Tabac’ in 2002 to become ‘Rocky Patel Premium Cigars’ and continued to produce tasty cigar flavors loved by cigar aficionados. The company is a multimillion dollars venture that makes more than $25 million in annual revenue. The company opened its BURN lounge in Naples, Florida in 2010 to provide lifestyle ancillary services including offering premium spirits, soul-rendering music, and entertainment accompanied by the best cigars for enriching lifestyle. The cigar is a 90-rated franchise handcrafted in Honduras featuring a wrapper from Ecuador Sumatra filled with long-filler tobaccos native to Nicaragua and Honduras. It sports profile of earth, coffee beans, and leather color handcrafted in classic shapes. You will find other variations of this cigar in other cigar traditional places like Cuban-sandwich blends. We don’t say a cigar is cheap, but let’s admit this is affordable and that would be a surprise if you are familiar with top-rated cigars. Rocky Patel investment in the cigar is an adventure, and this typifies the ease at which it explores various blends and creates many handcrafted cigars including Mulligans. This blend represents the finest cigars with more generosity in term of price in comparison with the values. This blend sports specially crafted wrapper and complex long-fillers from the core of Nicaragua, Dominican, and Mexico. This blend continues to be a top-selling brand of Rocky Patel cigars noted with its creamy finish of four favorite shapes. This is another handmade cigar with premium tobacco binder and filler. The Nicaraguan blend uses golden and silky Ecuador finish in its Connecticut wrapper leaf. The attraction is the almond cedar medium-bodied profile which exudes peppery aroma with a pleasant taste. This is the best smoke from Rocky Patel collection of cigars. It is full-flavored, full-bodied with a spicy taste. You will find four classic shapes of this blend with a Maduro or Corojo tobacco wrapper leaf. It carries within its structure delectable Nicaraguan binder and filler full-natured tobaccos. The Edge will keep you insatiable for more sticks of cigar after you experienced the first smoke. This cigar got impressive cigar aficionados high score of 95 point which stands it out as one of the best blends from Rocky Patel blends. The full-bodied cedar flavored, black peppered cigar sports almond hints of dried cherries handcrafted in Honduras. As with every its mix, Decades took its recipes from Nicaraguan and Ecuador with four different appealing shapes to choose. This cigar franchise got several aficionados high rating to bring it to the top of the menu of cigars from Rocky Patel brand. There are five favorite blends of Vintage that are readily available to cigar enthusiasts including Vintage 1990, Vintage 1992, Vintage 1999, Vintage 2003 and Vintage 2006. Each flavor of Vintage sport appealing wrapper with quality finishes and come at cool premium prices. You will find the Limited edition, Black label, and Sun Grown Maduro among other blends from Rocky Patel. These are amazing cigars worth investing your time and money to get to know better. Look & Feel. Wrapper quality, smell, the foot aroma, packaging, and the wrapper color. We check the quality of how it burns, draws, and heats, and the wrapper, and cap construction. Flavor & Balance. We review the overall taste, balance of flavors, body balance and strength, and complexity. Overall Rating. The cigar is a community product where many interest parties care about what you some; we take all aspects into concern as rated by recognized authorities in cigar quality promise. It is, for this reason, many of our customers trust us to bring them high-quality, premium cigar and accessories. Visit our store now for your Rocky Patel Blends.